How to Download a Twitch Video? With 2 million monthly broadcasters and over 15 million active daily users, Twitch is currently the largest live streaming platform for gamers on the Internet. If you can't find a game you are interested in playing on Twitch it means that it is probably not even worth playing. What's more, you don't even have to follow streams while they are live, because you can download all of your own videos as well as those created by other gamers on the platform using software like Twitch Leecher or 4K Video Downloader. 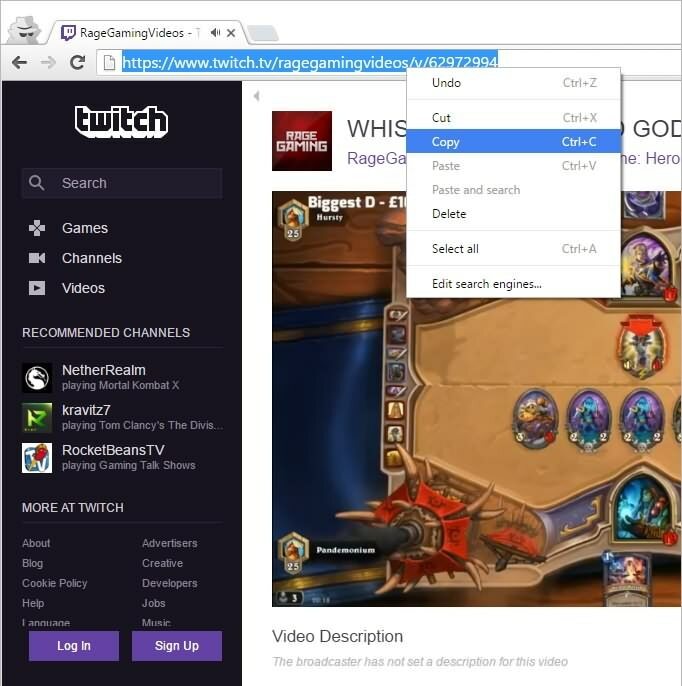 Here's how you can get videos from Twitch on your hard drive without breaking a sweat. How to Download a Twitch Video You Broadcasted? All of the Twitch's registered users can download their live stream videos, regardless of the type of account they have. However, if you have a regular user account, you only have two weeks before the video is automatically deleted from the platform's servers. The owners of Twitch Partner accounts have much more time to download their videos since their videos are deleted approximately two months after the video was broadcasted. In order to start downloading your videos from Twitch, you need to open the website in the new tab and make sure that you are logged in to your account. In the upper right corner, you'll be able to see a drop-down menu, click on it and select the Settings option. After the new window appears on the screen, you should click on the Channel & Video link and then find the Channel Settings feature. Mark the Automatically archive my broadcasts, and you're free to start streaming. All of your broadcasts will be available under the Video Manager option, that can be accessed from the Twitch's main menu. When the Video Manager window opens you'll see the thumbnails of all your videos, Below each thumbnail you'll see a Download link, click on it and enjoy watching a video from your hard drive. How to Download Other People's Twitch Videos? Every gamer has their own favorite gamers, so if you want to study or just admire the skills of some of the best gamers on Twitch you can download their videos. Twitch platform doesn't have a Download option for videos produced by users other than yourself, but you can easily overcome this obstacle by installing a software that lets you download videos from Twitch. You can get Twitch Leecher from GitHub for free and download videos from all gamers on Twitch. Head over to the Twitch Leecher's official page on GitHub, click on one of the exe files and then select the Run option to start the download. Launch the software, either by clicking on its desktop icon or through the Start Menu. 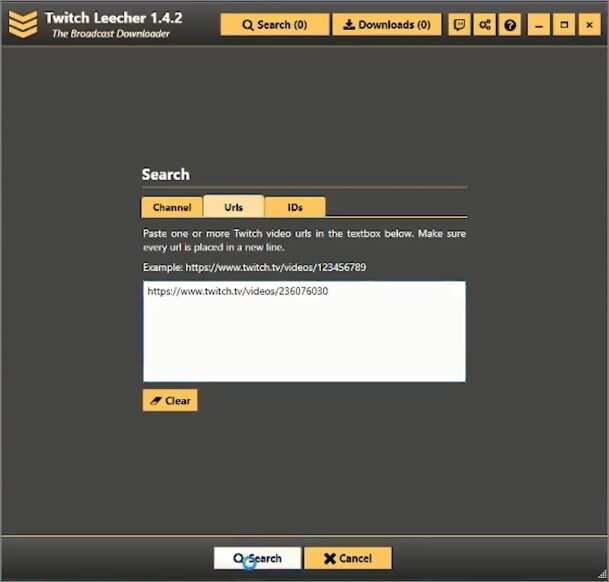 Click on the New Search when the Twitch Leecher launches and use your web browser to open Twitch. Use the platform's Search Bar to find the channel of a gamer whose video you'd like to download, and then click on the Video link to start browsing through their collection. Right-click on the clip you want to download and select the Copy link address option if you're using Google Chrome or the Copy link location option in Firefox. Bring up Twitch Leecher once more and paste the link to the software's search URL bar. You do this by either using the CTRL +V keyboard shortcut or selecting Paste from the right-click menu. Click on the Download button when the video appears and proceed to choose the resolution of the video, the file destination or pick the start and end points of the video. Twitch videos can last for hours, so make sure that you have enough space on your hard drive before you start downloading your favorite streams. If you are looking for a software that will enable you to download videos from all major video sharing sites like YouTube, Vimeo, as well as Facebook or Twitch, 4K Video Downloader is possibly one of the best options on the market. The software is compatible with both Mac and PC computers and you can download it for free from the manufacturer's website. After the installation process, you should launch 4K Video Downloader and then bring up your web browser and go to your Twitch account. Browse through the videos or go to a channel and locate the video you want to download. Click on the thumbnail of a clip to open it, and then copy the video's URL address from the top of your web browser, by right-clicking on it and selecting the Copy option. 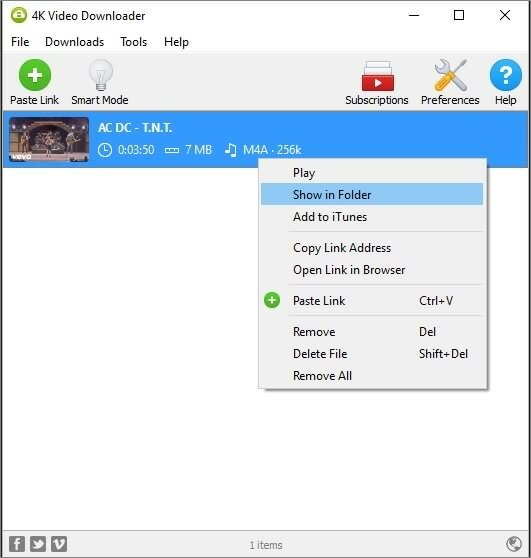 Find and click on the Paste Link icon in 4K Video Downloader to start the parsing the link. When the parsing process is finished, a new window will pop-up on your screen. Select the location on your hard drive where you want to save the video, choose the video quality and hit the Download button. If the video is too long or if you just want to download a segment of a video, you can click on the Stop button at any moment. After the video is on your hard drive, you can watch it or edit it in any way you want, just be careful not to use the footage in your own videos without asking for permission. The largest live streaming platform on the Internet is an endless source of gaming videos that can help you master any game. You can find thousands of different games on Twitch, which makes it pretty easy to see different styles of play or different approaches to a game you're currently playing. Downloading a video from Twitch is quite simple since you just have to copy and paste the video's URL into a software on your computer. It is also a great way to constantly have access to your favorite gaming clips, even when you're offline. Which method of downloading videos from Twitch do you like to use the most? Leave a comment and let us know.